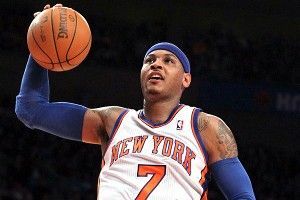 » Can Carmelo and Jeremy Lin Coexist? The breakout success of Jeremy Lin conspicuously coincided with Carmelo Anthony sitting on the bench. While Anthony was nursing a groin injury, Lin stepped in to run Mike D’Antoni’s fast-paced pick-and-roll offense. Through all the Linsanity hyperbole, commentators wondered how Anthony — notorious for preferring isolation plays that slow down the ball and the game — would fit in. Since his return, the Knicks have tried a few offensive strategies centered on Anthony — some successful, some not. But if they are going to win with Lin at the point, they need to hone in on the effective ones. When Lin stepped up, Knicks fans were excited about the possibility of him creating catch-and-shoot opportunities for Anthony. He could spot up outside of a pick-and-roll, instead of always creating his own shot. But Carmelo simply hasn’t shot the ball well this season. He is the rare shooter who is more effective after holding the basketball for a few seconds. In the open catch-and-shoot, most shooters square up toward the basket before the ball even comes to them. They have their hands and feet ready, with their knees bent so they can catch the basketball and go straight into the shot. Anthony, however, stands straight up, without his feet set, as the ball arrives. Once he makes the catch, he rushes the shot, which is apparent in his footwork. Most successful shooters rise up and land in the same spot, but Anthony either keeps advancing or immediately backpedals. One of the problems for Anthony is that his isolations are almost anathema to the offense Lin is running. With Lin at the point, working off ball screens, the basketball zips around very quickly. Even when Lin isn’t making an assist, he passes the ball to an open teammate, who in turn makes a quick pass to another open teammate, who then gets a good look. When Anthony makes the catch on the wing and holds it, everyone on the court knows what happens next: it’s going to be an isolation. The defense loads up against him because they know Anthony will try to create all on his own. That’s what the Miami Heat did against him, and that’s what most good defenses will do. Now the defense has to worry about Anthony getting to the rim (even when he is struggling, he’s still a respected scorer in this league) plus a screener rolling to the basket. Since the defense will double-team Carmelo, he can make an easy pass to an open teammate. The results have not been great so far, but Anthony is a strong passer who can exploit these situations. More importantly, these plays work well with D’Antoni’s offense and ultimately create open shots for the other players. Lin is actually a great complement to Anthony when he posts up, because Anthony uses his body to create the passing lanes that Lin needs. And since Anthony is a threat with the ball in his hands, defenses sink in on him, which creates open shots for other players like Steve Novak, J.R. Smith, or even Jeremy Lin — all of whom can knock down open shots. Finally, when Anthony faces up and essentially turns his post-up into an isolation, he begins 10-15 feet away from the basket, opposed to outside the 3-point line. He has the option to shoot after holding the basketball for a little while — which he is very good at — or if he chooses to drive, it’s harder for the defense to close in on him. The Knicks coaching staff didn’t use Anthony in the post before the Jeremy Lin era, but they have quickly learned that this strategy would be essential to their success. In the last game against Cleveland, Anthony posted up seven times. That is a clear indication that we can expect to see more of it on Sunday when the Knicks face the Boston Celtics, and for the rest of the season.